Welcome to Old Mill Village. We are located at 40179 Enterprise Drive in beautiful Oakhurst, California. We are home to many amazing tenants including stores of all types and multiple restaurants. Near by is our Enterprise center which includes many industrial business locations. At Old Mill Village you can get your shopping needs met while enjoying the beautiful scenery, visit us today. Some of our tenants include big names such as VONS, CVS, Radio Shack, Big 5 Sporting Goods, PayLess and many more. To view a full directory of our businesses click here. 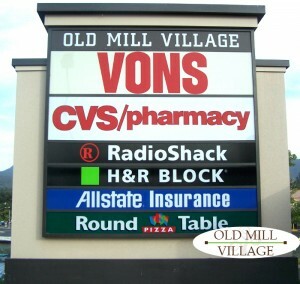 We also offer leasing options for new businesses looking to rent in our premier Old Mill Village location. For leasing information please click here. View all of our businesses, stores and restaurants in the Old Mill Directory. View the map and directions to the Old Mill Village in beautiful Oakhurst. Get information on our Enterprise Center located near Old Mill Village. Information for businesses looking to lease at Old Mill Village.